The First Class Cabin is the litmus test that divides the luxury airlines from the everyday. You know that if the an airlines is among the best First Class Airlines then that’s bound to trickle down to the other cabins. And First Class across the board just keeps getting better. As Business Class Cabins become increasingly spacious with the deluxe extras that were once exclusive to First Class like fully-flat bed seats, First Class Cabins have in turn gone to a whole new level of luxury in the sky. 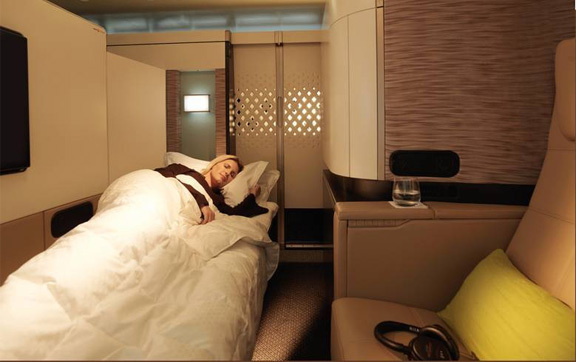 Here we have compiled a list of our picks for the best First Class Cabins flying out of Australia. They’re in no particular order as it all depends on your preferences – stopover, airline alliance, limos or no, private doors or no, where you’re flying and when. First Class is an extremely personalised experience and your choice of airline should be likewise, but those featured below are certainly a cut above the rest. Relax in your own private apartment in Etihad First Class. The first airline to introduce a single isle configuration (meaning there is just one seat on either side of the aisle), Etihad is actively seeking to revolutionise what we expect in First Class. Due to this configuration the First Class Apartment is extremely spacious, you could close the door and walk around inside if it pleased you. The catering, thanks to their onboard chef, is also world class. In terms of other amenities, Etihad is one of few airlines to offer a shower onboard for their First Class customers as well as an onboard lounge bar for when you need to stretch your legs and complimentary airport limousine transfers to help take the stress out of your journey. 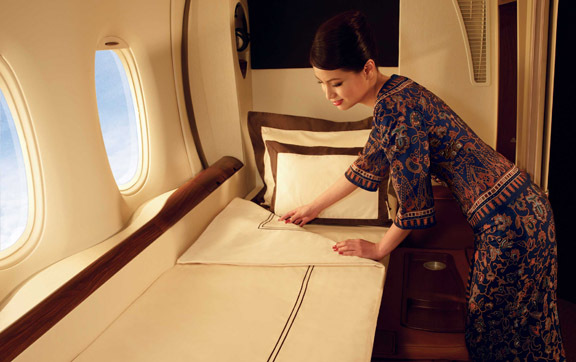 Singapore Airlines is a forerunner when it comes to the best seats in the sky, in any class. Their First Class Seats are 35 inches wide, with a bed length of 82 inches – though they may feel not so much like an airplane seat as a train compartment thanks to their double-sliding doors which provide ultimate privacy. The food on Singapore is also superb and for those travelling with a companion, Singapore is the only 5 star airline to offer a double bed in the sky. Every aspect of the Emirates Airways First Class experience is deluxe to the extreme. 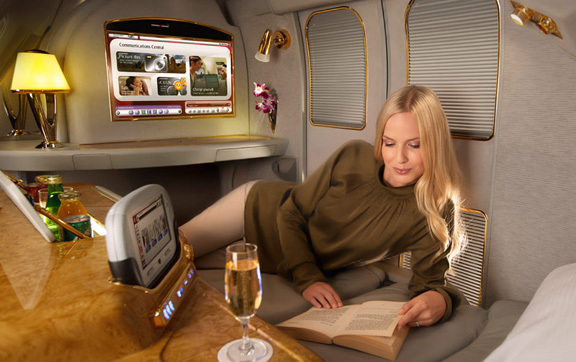 Apart from your private suite with personal mini-bar and service from your doorstep with complimentary limo transfers, Emirates has even more to offer. There’s a superb dine-on-demand menu, an on-board bar and the best First Class bathroom (complete with shower) you’ll be enjoying yourself too much to notice the long flight. If flying from Australia, Qantas is first choice when it comes to flying direct to your next destination, whether it be Asia, Africa, Europe or the Americas. So for Australians its world-class First Class is well-worth the mention. 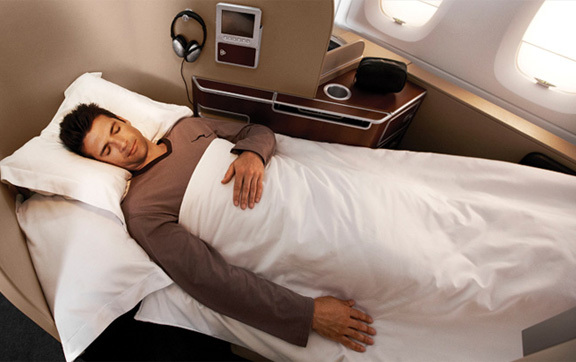 Qantas’ First Class seats are designed with lie-flat beds that are a generous 6.5 feet with a mattress of plush sheepskin. You can enjoy a Neil Perry eight-course tasting menu for two in the sky all within your suite whilst sampling Qantas’ award-winning wine list. Qantas is luxury with an Australian twist. While not technically First Class, Etihad’s Residence deserves a mention for having created a class all of its own. 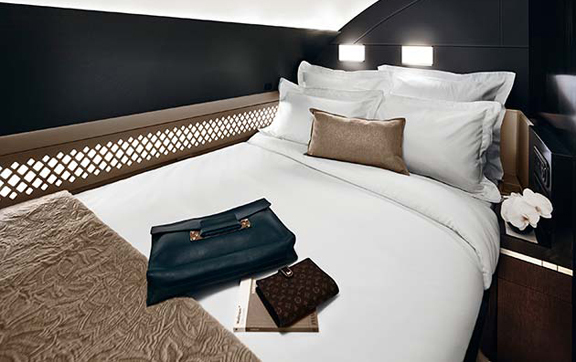 Located on the upper decks of their A380s the Residence includes its own living room, separate double bedroom, ensuite bathroom with shower and your own personal chef and butler. Beyond a private jet, it’s about as luxurious as flying can get.